Navarre, North Florida, is on its way to become one of the most attractive places in the United States. Every year, thousands of people discover the great potential of this charming coastal city. Practically, Navarre offers everything a person needs to live well – sea, sun, fresh air, tasty food, safety, excellent opportunities for personal and professional development and affordable cost of living. Navarre is one of the places with the most beautiful beaches in North America. If you come here for the first time, you probably will be amazed by the snow-white sandy coastline, which stretches for miles. The waters of the Gulf of Mexico are warm and are usually quite calm, making Navarre a great place for those who just want to swim. The white sand, which reminds the Mexican resort city of Cancun, is the main reason for the crystal clear waters along the shore. The lack of waves most of the days and the shallow water make the place attractive for family holidays. Property prices in Navarre are among the best in Florida, and it’s a pretty good recommendation, especially considering the fact that the state itself is pretty competitive in this respect. As a whole, Florida attracts with good prices people not only from the US but from all over the world, and in this respect, Navarre is one of the best locations. Here, with just a little patience, you can find a luxury and large house on the beach at prices well below one million, which in the US is considered to be a pretty good price. Navarre is one of the safest places to live in Florida, and crime levels here are among the lowest in general, not only in the state but in the country. Usually, the risk of becoming a victim of crime in Navarre is very low, and this one of the main reasons that attract many people to settle here with their families. If you are looking for a safe place to live in Florida, keep in mind that Navarre is one of the best options. 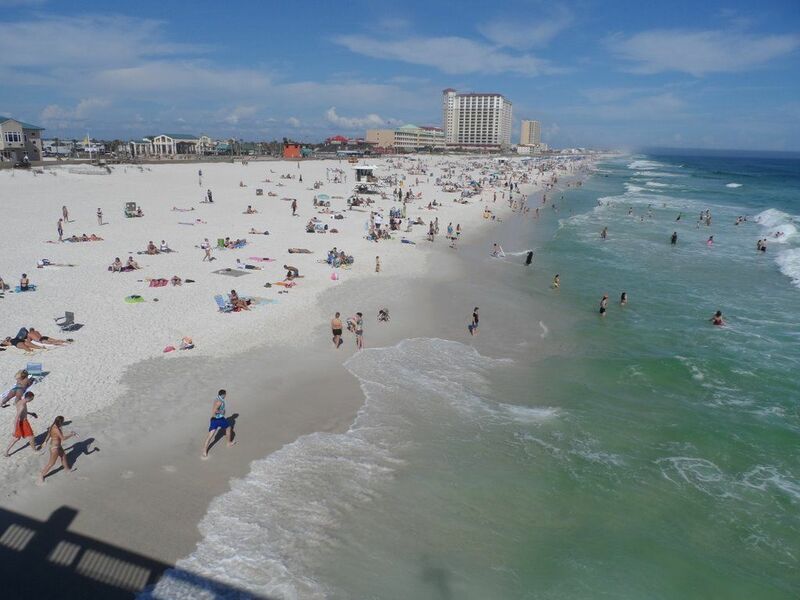 Unlike many other locations in Florida, the beaches of Navarre are less-crowded and offer enough space for everyone. Even in the height of summer you can find places to spend a quiet day on the beach with no other people around. The reason for this is the ratio between the number of locals and tourists on one side and the huge coastline on the other side. With its length of approximately 12 miles (nearly 20 kilometers), this is one of the most impressive beaches in Florida. If you are looking for a place with great beaches to live, the coastal city of Navarre is hard to compete. Navarre offers a wonderful subtropical climate with long summers and about 230 sunny days a year. Even in January and February you will find here a mild and pleasant weather. Actually, the weather during the winter season looks more like a spring than winter. Beach season in Navarre lasts from April to October and nice days for beach there are sometimes even in March and November! Of course, it is not as warm as it is in South Florida during the winter season, and still the city is similar to the warmest places in California or South Europe. The driving force of the economy of Navarre is the well developed tourist industry in the region. Although tourists often leave a lot of waste behind, yet we can not compare the garbage left behind a small group of people on the beach with the air pollution caused by the large factories around the world. In addition, unlike the situation in the major cities, there are no serious problems with air pollution from too many cars because the area is not overpopulated. Although it is developing very dynamically, Navarre is a city that still offers an extremely relaxed and pleasant pace of life, which is a typical feature of many small towns and cities in the south of the United States. The population of the urban area of Pensacola, part of which is the city of Navarre, is about 448,991 people. This is considered to be the best size of a city because it is big enough to be interesting and is at the same time small enough to be less stressful and less expensive. The number of young people who come to Navarre attracted by the good business environment in Florida is growing very fast. Navarre is a great place in this respect because unlike other places in the US, where all business niches are occupied long time ago and the level of competition is huge, the city of Navarre still offers a lot of business options. If you are dreaming to make a career in the army, we cannot miss to say that one of the most powerful engines of the economic development in the area is the Naval Air Station Pensacola, which is one the largest in the United States. For this reason people often call the city of Navarre with names such as “the Military Riviera “. The combination of tranquil way of life, clean environment and good schools make Navarra a great place to raise a family. This quality of life is much better compared to many of the major US cities and the risks in everyday life are lower. The good climate in the area as well as the high quality food are another reason to settle with your children here. As Navarre is an important tourist centre, the opportunity to find a lot of nice places that offer delicious food is much bigger than in most other places in the United States. This is another good reason to come to Navarre. Like other cities in the state, this romantic place in Florida is known as an attractive destinations for culinary tourism because of the numerous options to eat delicious and fresh seafood in some nice and not very expensive restaurant.